Time of Origin: Earth, Switzerland, 1816. 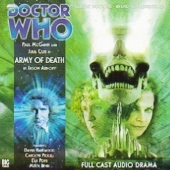 Appearances:	"The Company of Friends - Mary’s Story" to "Army of Death"
History: Mary is a particularly significant companion for The Doctor as she is a prominent figure in history even without coming in contact with him, known to the world for writing the famous novel Frankenstein, inspired by the circumstances under which she originally met The Doctor. Originally the daughter of political philosopher William Godwin, Mary was convinced to leave home by the charismatic poet Percy Shelley. Percy originally promised Mary a life of adventure, abandoning his life and child to be with her, but Percy went on to have an affair with Mary's half-sister Claire while they were staying in Geneva, lacking any real belief in fidelity - and despite Claire's own greater interest in fellow resident Lord Byron -, and leaving Mary feeling fundamentally dejected about her life and the direction it was currently taking. During one night at Byron's house on the shores of Lake Geneva, just as they were planning to write ghost stories to entertain themselves for the next few nights, Mary and her friends were shocked to be visited by a disorientated figure, covered with various injuries and blisters, who appeared to introduce himself as 'Doctor Frankenstein' before collapsing into a death-like coma, forcing them to take him into the house to try and treat him. Unable to do anything about the seemingly fatal injuries beyond leaving him to relax in the study, their guest's condition grew ever more precarious as time went on, only recovering briefly to mention that he required lightning to 'resurrect' himself and make various vague claims that he knew Mary. When their strange visitor apparently died of his injuries, Percy- currently high on laudanum - suggested that they conduct an experiment, using lightning from the storm that night to see what effect large volts of electricity might have on a human corpse (Inspired by a similar experiment on a frog's legs), only for the lightning to revive their visitor's body in the form of a hideous monster before he fled into the night. Tracking the 'monster' to a strange blue box - refusing to be frightened of the figure's hideous appearance when he was clearly afraid himself -, Mary was shocked to discover that the box - the TARDIS - was bigger inside than it was outside, becoming even more confused when 'Frankenstein' claimed that she had travelled with him for years despite her never having met him before. Although he was able to briefly explain to her that he had been infected with vitrius time as a result of a breach in the TARDIS's internal structure during a temporal storm, the injuries caused by the corrosive energy hindering his ability to regenerate, the stranger was forced to send a signal to get help before ordering Mary to run before he lost control of himself again... only for Mary to encounter a younger version of the man - revealed to be the Eighth Doctor - when the TARDIS materialised back in the house while the 'monster' attacked the outside. Realising that the other creature was his future self, the newly-arrived Doctor was able to calm his monstrous counterpart down with the TARDIS key, concluding that the TARDIS had brought his future self here after his injuries to receive the necessary treatment to trigger a renewal. Noting that his future TARDIS was too damaged to restore itself and its Doctor to health, the past Doctor used a power cell from his TARDIS to restore its future self, allowing the future Doctor to recover before departing after thanking his past self. With his future self having departed and her friends and family engaged in another quarrel, The Doctor asked Mary to travel with him, offering her a chance at the life of adventure she had failed to find in her life with Percy, prompting Mary to remember the future Doctor's comments that she had travelled with him and thus concluding with a smile that it was her inevitable destiny to do so. Although she had some trouble processing the idea of travelling in time at first, being shocked when she learned that they were in 1873 rather than 1816 due to an error on The Doctor's part on their first trip and worrying about how her friends would look at this time, Mary still enjoyed the opportunity to travel even if she felt that the TARDIS deprived them of the ability to witness the scenery between their destinations. Although The Doctor was known to mention Mary's future destiny at times, such as commenting that she was a writer of science-fiction when Mary was unaware what that genre actually was, he generally avoided giving her any specific information, with Mary never asking him for such information and often going out of her way to avoid learning the truth, to the point that she gave the TARDIS library's copy of her autobiography to a visiting squire who had helped her ("The Witch From the Well"). 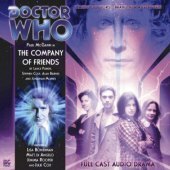 Throughout her time with The Doctor, Mary displayed the exceptional balance of courage and compassion that was found in the best of The Doctor's companions, even if that could result in problems at times. 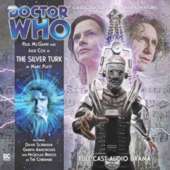 When faced with a Cyberman for the first time ("The Silver Turk"), Mary objected to The Doctor's immediate suspicion of the Silver Turk considering its weakened appearance. Although this resulted in her later being manipulated into helping the Cybermen mount an attack, The Doctor never blamed her for her mistake, acknowledging that she had acted out of good intentions where her only problem was a lack of understanding of the situation facing her. Mary also expressed horror when she learned of the Cybermens' history both because of the physical mutilation they had undergone and their lack of religion to preserve their souls. Although she briefly thought about leaving The Doctor after she was attacked by mobile puppets that appeared almost perfect duplicates of humans, Mary decided to continue to travel with him after they defeated the Cybermen, recognising the good they could do ("The Silver Turk"). While willing to stand up for what she believed in regardless of the power of the entities facing her, Mary continued to see the good in people when she could; when a pair of twins stole the TARDIS from The Doctor, Mary initially regarded them merely as spoiled children acting out until she learned their true, more malicious agenda ("The Witch from the Well"), and quickly concluded that a woman called Nia wasn't a killer despite the fact that they met when Nia took The Doctor and Mary hostage ("Army of Death"). Mary's interaction with The Doctor was a subject that constantly surprised her. Although he made some tasteless comments about Mary's husband Percy in particular - apparently feeling that Mary deserved better than Percy despite the fact that history recorded their relationship -, Mary generally enjoyed his company, The Doctor commenting that he also enjoyed Mary's company despite the obvious risk to history if she should die while travelling with him before she could write her books. As time went on, Mary was forced to uncomfortably acknowledge that she was developing feelings for The Doctor despite her marriage to Percy, recognising that both of them possessed a refined but independent spirit; although her feelings cooled when she saw The Doctor being so intrigued by the science behind the horrific discoveries of the twisted Karnex, The Doctor's willingness to sacrifice himself to save others redeemed his earlier disregard in Mary's eyes ("Army of Death"). Mary was also naturally amazed at the TARDIS - regarding its interior as an expansion of perception to help her cope with its impossible scale -, spending some time in its library, developing enough awareness of the ship to recognise that it was more than a machine, to the point where she felt that the ship was more temperamental when piloted by anyone other than The Doctor, such as when the Veraxil twins used it to travel to the twenty-first century while leaving The Doctor in the seventeenth century ("The Witch from the Well"). Keeping a journal about her time with The Doctor, she admitted to a sense of giddy delight about the opportunities to visit other planets, even if some worlds didn't live up to the promises The Doctor had made. Foreshadowing the attitude that would inspire her writing, Mary always recognised that there were limits to what man could or should do, to the point that she resisted the temptation to learn about her own future despite The Doctor's occasional hints, even giving the TARDIS library's copy of her autobiography to a local squire who assisted her during the Veraxil crisis rather than reading it herself, with her research of her friend Lord Byron simply focusing on what had happened in his life prior to their meeting at Geneva rather than what would happen to him afterwards. Although other details of her time in the TARDIS are unknown, comments made by the future Doctor suggest that the two of them encountered the Axons ("The Claws of Axos") and met King Harold at the Battle of Hastings during their time together. Despite her enjoyment of their time together, Mary and The Doctor eventually parted company, Mary deciding that she wanted to return home and leave the death that seemed to be The Doctor's only true constant companion that she had previously overlooked out of her fascination with him, returning to her life and place in history without anyone knowing of her absence (Although some have speculated that her novel The Last Man, looking at the survivors of a plague on Earth in the future, may have been inspired by something she experienced while travelling with The Doctor). As Mary departed, however, she left The Doctor her journal so that he could receive a better impression of what went through the minds of the people who travelled with him, The Doctor being particularly touched at the chance to receive an original work by Mary Shelley. Even after her time with The Doctor, Mary has continued to make an impact on history, with her novel Frankenstein earning her great acclaim for pioneering so many ideas that would later be used in modern fiction, such as the implications of creating life or the idea of science possessing limits. The Fourth Doctor even spent some time with a duplicate of Mary created from historical records in the thirty-second century - although she was naturally unaware of her unrecorded time with the Eighth Doctor as her memories were only based on historical records of Mary rather than anything acquired directly from Mary's memory -, this Mary helping the Fourth Doctor defeat a powerful entity that had mimicked a powerful reality-shaping monster, healing The Doctor of a potentially fatal injury and piloting the TARDIS to him as he trapped the entity in the vortex ("Managra").